We were eating comically large burgers at Paul’s on St Mark’s Place and talking, in the earnest and embarrassing way that college students do, about books that we really felt defined us. I remember thinking vaguely, as he wiped melted American cheese from his mouth, that I would be a little bit mortified if anyone was eavesdropping on our conversation. When our burgers were finished I walked over to the bookstore. The Road had just come out a few months earlier and was still being prominently displayed in the front window of the shop. The boy at the counter shuddered while ringing it up— “You’re brave for this one, girly” he told me, pushing it into my hands so eagerly it was as if the cover was burning his. I made it through about twenty pages on my subway ride home and by the time I walked in my front door and looked in the mirror my face was ashen and my knees felt like jell-o. After fifty pages I was in a cold sweat and had to tuck the book into a drawer in the other room before trying to fall asleep. Adventure? Friendship? Humor? Had he even read this book? I felt betrayed. 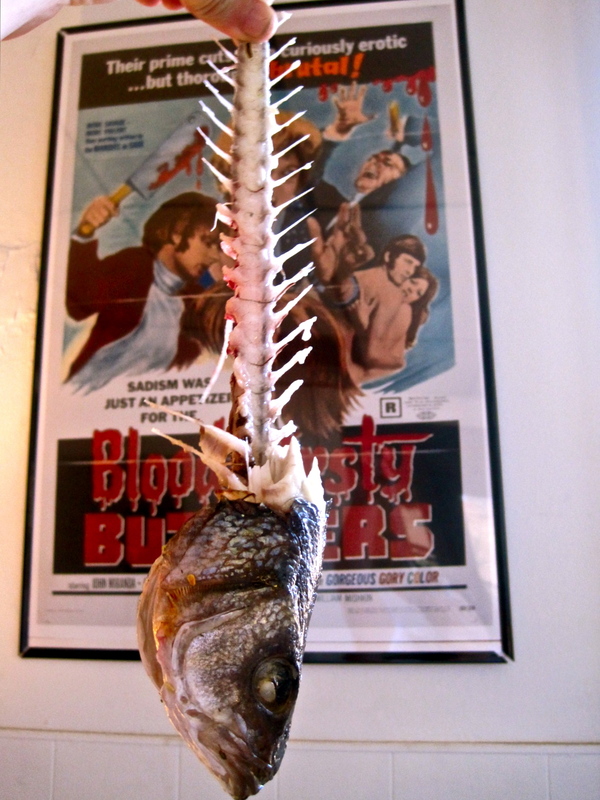 A few days later I was invited over to the boy’s apartment for dinner. I was building up the nerve to tell him that I couldn’t make it past fifty pages of his favorite book when I noticed a stack of various editions of Jack Kerouac’s On the Road sitting on his coffee table. Opening one up I saw that it was absolutely covered with underlines and stars, notes and exclamations written in scratchy boy handwriting—it looked not unlike all of my favorite books. It suddenly occurred to me that I had tortured myself with The Road for no reason at all. Loving post-apocalyptic literature is one thing—I can even chalk forgetting the name of your favorite novel up to first-date-jitters, but allowing Jack Kerouac to define for you what it means to be a man is, for me, an issue. 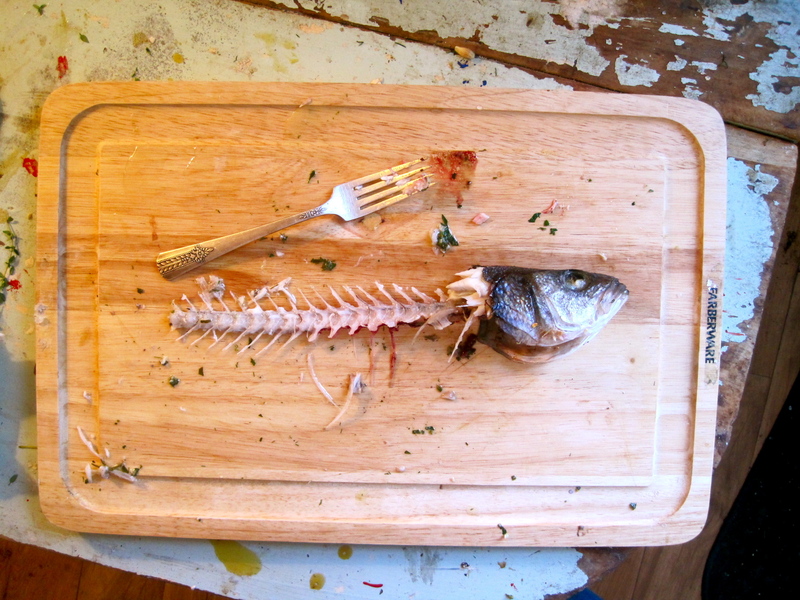 That dinner was our last. I gave my unfinished copy of The Road to my across-the-hall neighbor and didn’t touch another post-apocalyptic novel until a friend of mine gave me a copy of Peter Heller’s The Dog Stars a couple of months ago. She, and many of the reviews I read, described it as “The Road but with hope,” which is probably why it took me so long to pick it up–I was terrified of reading anything resembling The Road. When I finally did crack it open though, I was not sorry at all. In sparse and heart-wrenchingly beautiful prose Heller tells the story of a man named Hig who has lost everything to a superflu that wiped out ninety percent of the human race. He lives in the hangar of an abandoned airport with his dog, Jasper, and a man named Bangley who seems to enjoy the cruelty and violence that surviving in a post-apocalyptic world allows him to enact. What sets The Dog Stars apart from other novels of its kind is Hig himself. The Dog Stars is more about what it means, at the very core, to be human than about what happens when “civilized” society crumbles. What really set this novel apart for me, though, was the food. Normally in novels of this kind there is very little, if any food, and what there is is hardly ever appetizing. The food in The Dog Stars on the other hand is mouth-watering. Hig plants beans, tomatoes, potatoes, eats venison heart, he cooks catfish with dandelion salad with basil, makes tea from a jar of summer flowers, wild strawberry, black raspberry and mint, he eats shepherd’s pie dripping with butter and drinks pitcher after pitcher of cold milk. 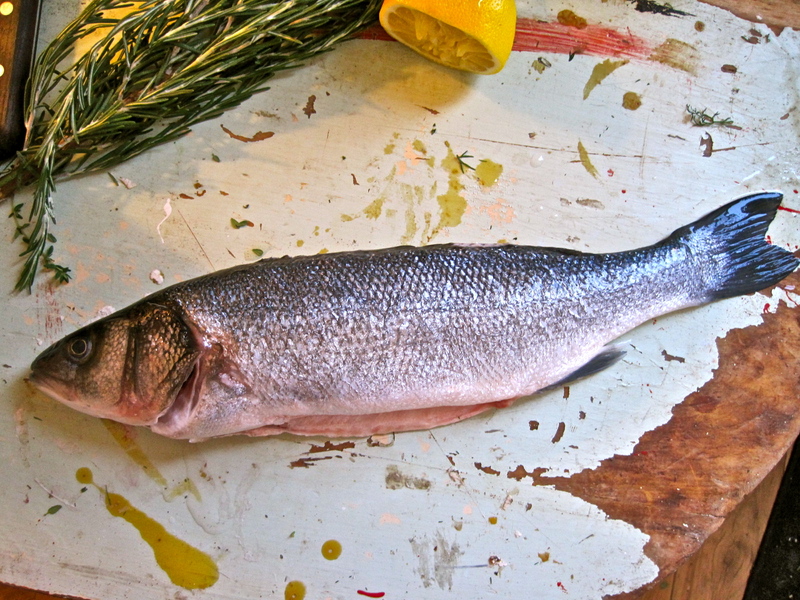 The most powerful, most prevalent food scenes in the book, though, are ones related to fishing—trout-fishing specifically. In the summertime when I was a kid, my dad would wake me up while it was still dark outside and we would go fishing for sea bass in the cold black of the Atlantic ocean. It was thrilling, sneaking around the bedroom trying to get dressed as quietly as possible while my sisters slept. My dad waited in the kitchen where the smell of newspapers and coffee and aftershave hung heavy, the nighttime sounds of crickets still creaking through the window screens. After fishing we always went to a breakfast place called Arno’s and ordered enormous stacks of buttermilk pancakes and tiny griddles of corned beef hash. At first this was what I looked forward to most about these fishing excursions. The casting and the waiting and the shivering were, in the beginning, just a means to an end, but eventually I grew to love the pre-pancake ritual, too. I never became a great fisherwoman but I learned volumes about patience and silence. One morning I caught a horseshoe crab by accident and reeled it in, scrambling and scratching against my hook. I had only ever seen dried up pieces of them on the shore and seeing one in all of its prehistoric glory gave me pause. It was as if the world suddenly threw back its hood and revealed just how tremendously old and sturdy it was and how easily it would continue to thrive once we are, all of us, gone. 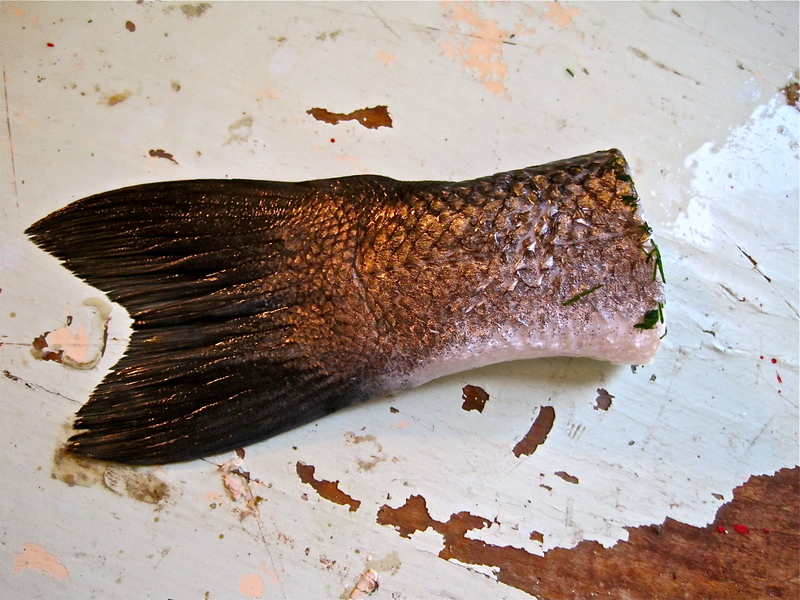 When I went to the market yesterday I lingered over the trout for a good five minutes before the man behind the counter got impatient with me and demanded I make up my mind. 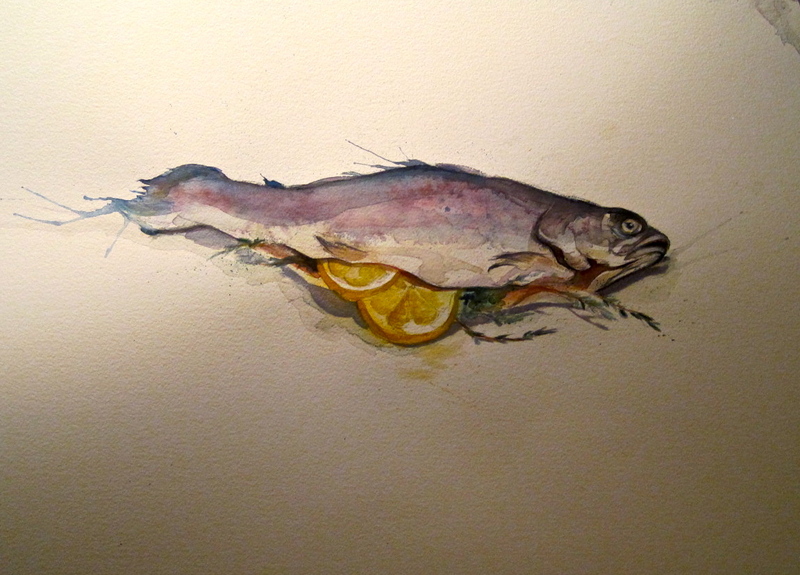 It didn’t seem right to cook trout for this book, even despite it being mentioned so many times throughout. 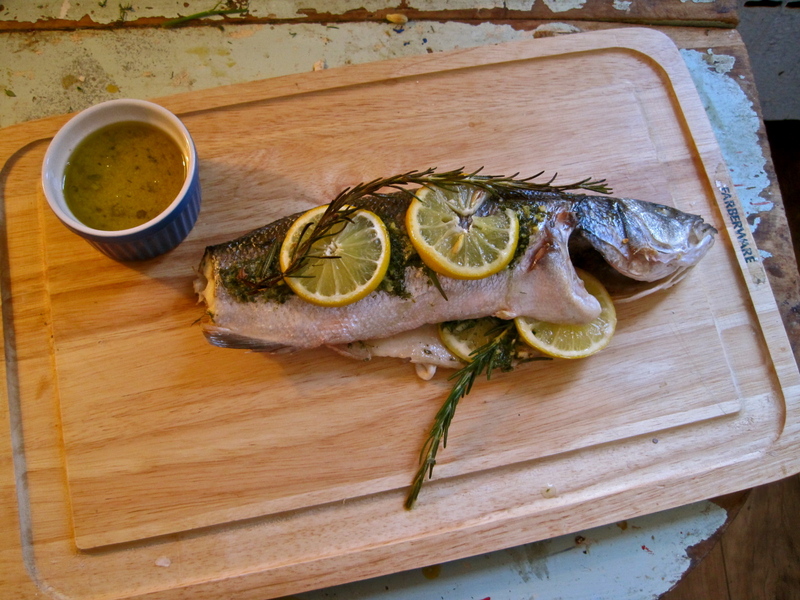 I ended up buying branzino instead, but trout would certainly work for this recipe, as would just about any fish. 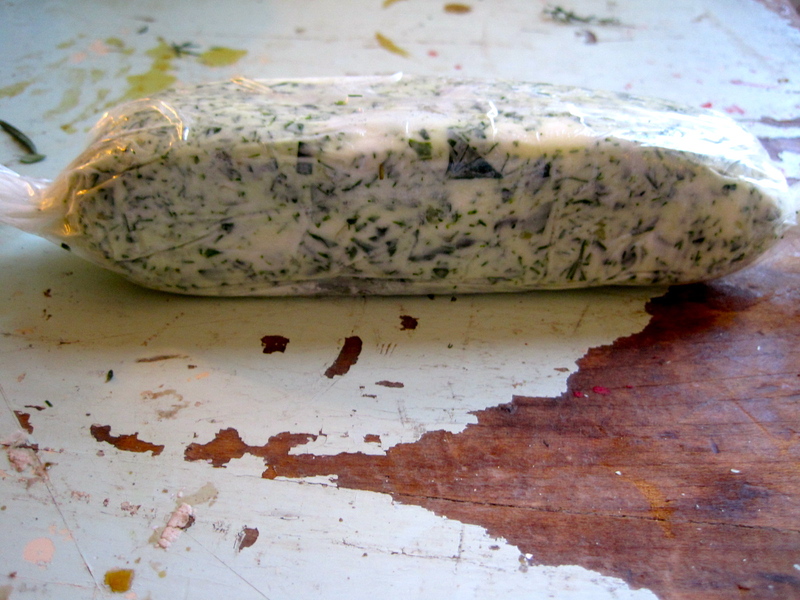 This herb butter freezes well and will stay good for at least a month (refrigerated about a week and a half). 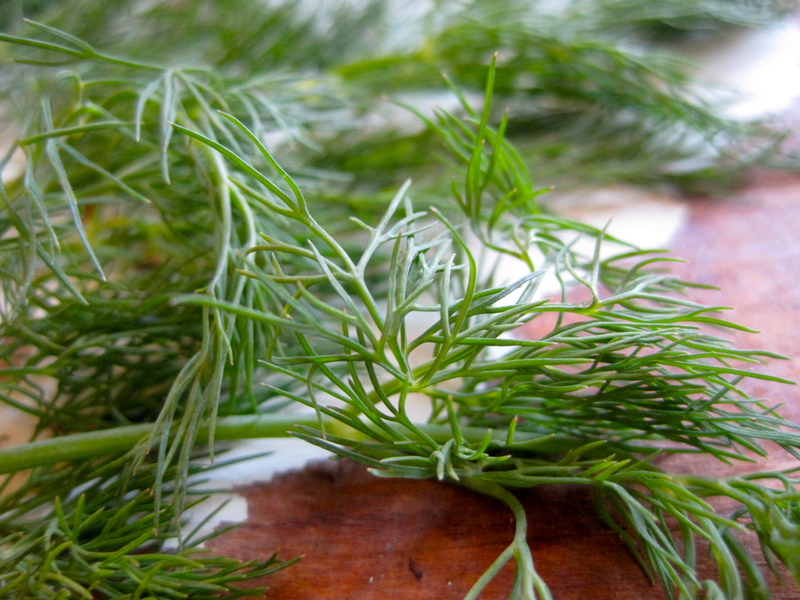 It’s a great thing to have on hand to make anything fancier (bread, pasta, roasted vegetables) and also a good way to put wilting herbs to use rather than throw them away. Place your butter in a mixer fitted with a paddle attachment. 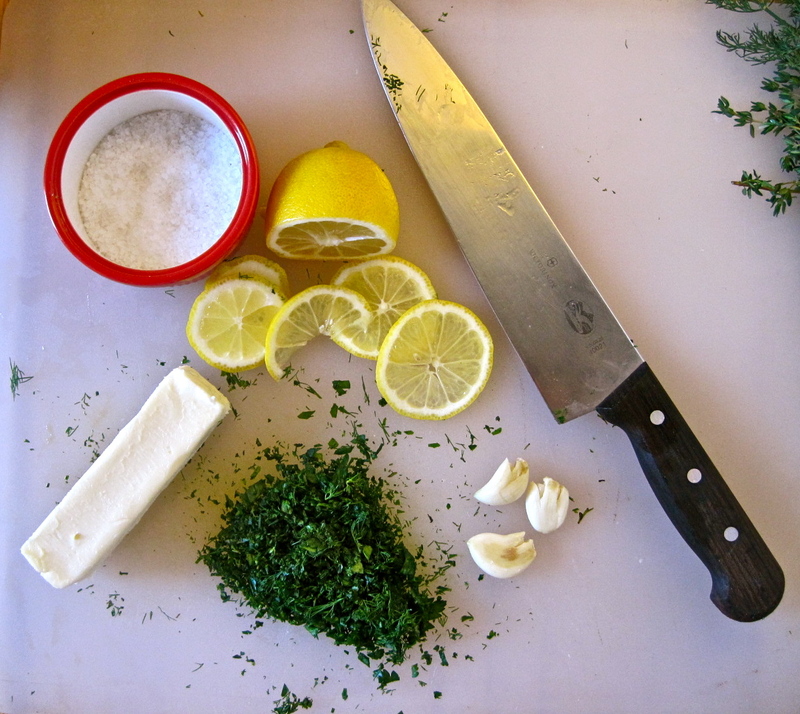 Finely chop your picked herbs and garlic and add them to the butter. 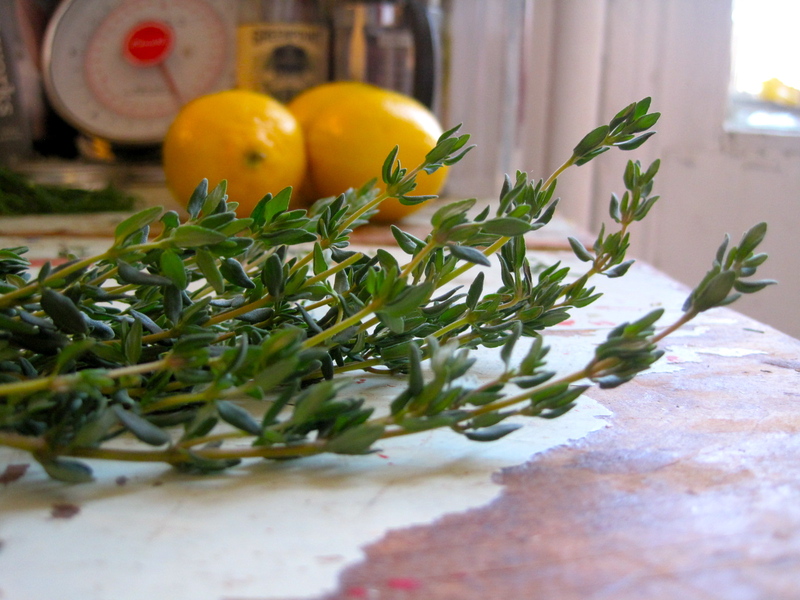 Add 1 Tablespoon of lemon juice and a pinch of salt and pepper and beat until well-mixed. Scoop the butter onto a sheet of plastic wrap and roll it tightly into a tube-shape. Refrigerate until set, about 40 minutes. 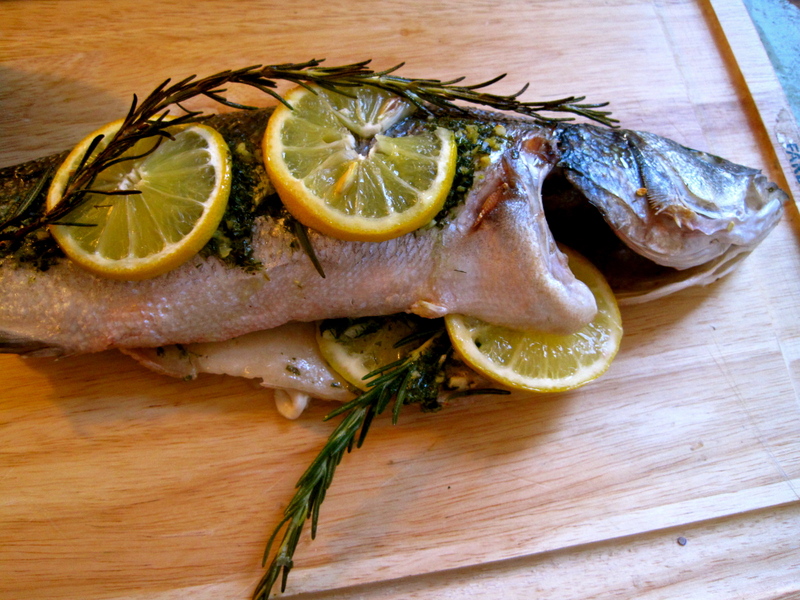 Pre-heat your oven to 450 degrees F. Rinse your fish and pat it dry. Salt the inside and outside of the fish well and place it in a shallow baking dish (I had to cut the tail off of mine so that it would fit). 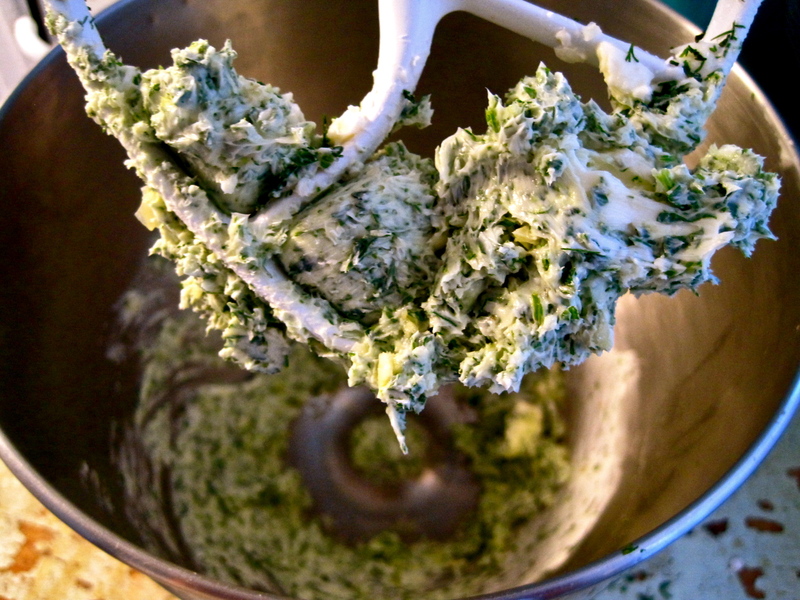 Cut half of your herb butter into disks and place the rest in the fridge (you’ll only be using half). 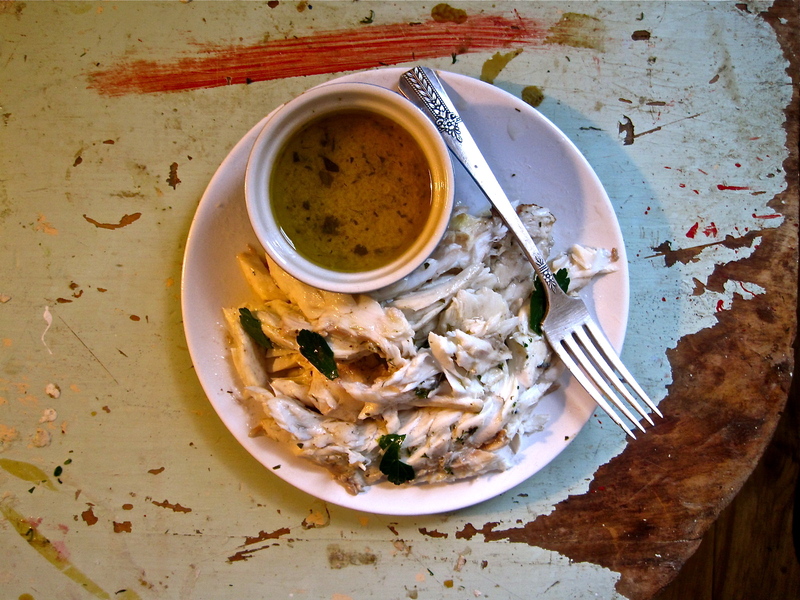 Stuff butter disks inside of the fish and top with lemon slices. 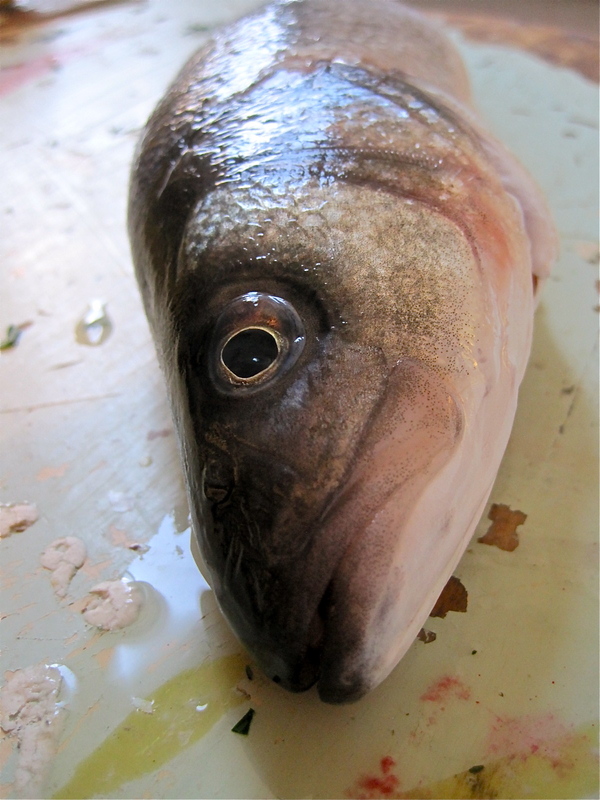 Do the same on the outside of the fish. Salt and pepper and drizzle with olive oil. Add about 1 cup of dry white wine to the baking dish and cover with tinfoil. 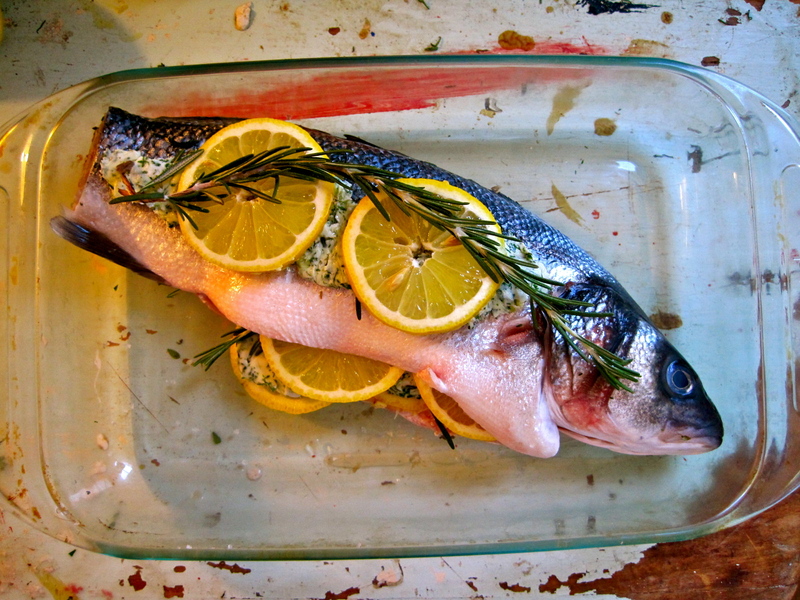 Place in the oven for 15 minutes. Remove tinfoil and roast 7-10 more minutes. 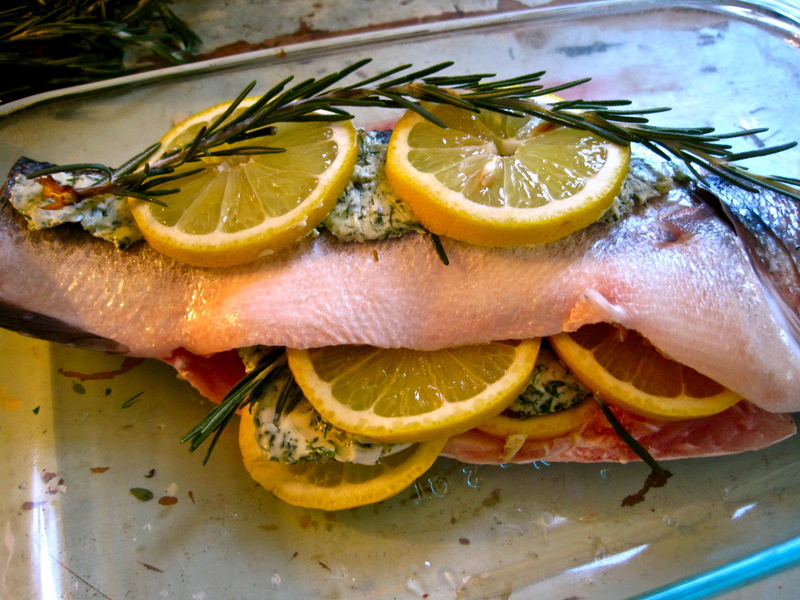 The meat should release from the bones and you should be able to “unzip” the fish and enjoy the meat easily.